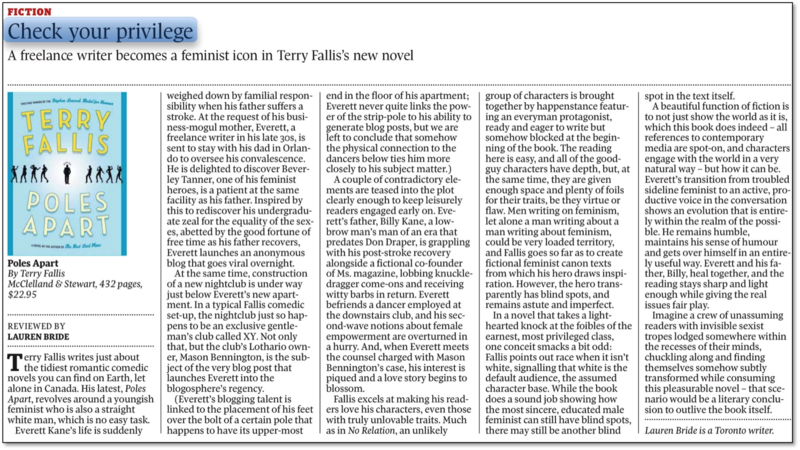 When the Globe and Mail review of your novel is longer than expected, it’s even harder to read the entire piece while holding your breath. I was very happy after I exhaled. Terry Fallis writes just about the tidiest romantic comedic novels you can find on Earth, let alone in Canada. His latest, Poles Apart, revolves around a youngish feminist who is also a straight white man, which is no easy task. Everett Kane’s life is suddenly weighed down by familial responsibility when his father suffers a stroke. At the request of his business-mogul mother, Everett, a freelance writer in his late 30s, is sent to stay with his dad in Orlando to oversee his convalescence. He is delighted to discover Beverley Tanner, one of his feminist heroes, is a patient at the same facility as his father. Inspired by this to rediscover his undergraduate zeal for the equality of the sexes, abetted by the good fortune of free time as his father recovers, Everett launches an anonymous blog that goes viral overnight. At the same time, construction of a new nightclub is under way just below Everett’s new apartment. In a typical Fallis comedic set-up, the nightclub just so happens to be an exclusive gentleman’s club called XY. Not only that, but the club’s Lothario owner, Mason Bennington, is the subject of the very blog post that launches Everett into the blogosphere’s regency. A couple of contradictory elements are teased into the plot clearly enough to keep leisurely readers engaged early on. Everett’s father, Billy Kane, a lowbrow man’s man of an era that predates Don Draper, is grappling with his post-stroke recovery alongside a fictional co-founder of Ms. magazine, lobbing knuckle-dragger come-ons and receiving witty barbs in return. Everett befriends a dancer employed at the downstairs club, and his second-wave notions about female empowerment are overturned in a hurry. And, when Everett meets the counsel charged with Mason Bennington’s case, his interest is piqued and a love story begins to blossom. Fallis excels at making his readers love his characters, even those with truly unlovable traits. Much as in No Relation, an unlikely group of characters is brought together by happenstance featuring an everyman protagonist, ready and eager to write but somehow blocked at the beginning of the book. The reading here is easy, and all of the good-guy characters have depth, but, at the same time, they are given enough space and plenty of foils for their traits, be they virtue or flaw. Men writing on feminism, let alone a man writing about a man writing about feminism, could be very loaded territory, and Fallis goes so far as to create fictional feminist canon texts from which his hero draws inspiration. However, the hero transparently has blind spots, and remains astute and imperfect. Interestingly, Everett’s political hero Beverley Tanner is famed for her memoir The Funny One: Reflections of a Feminist with a Sense of Humour; having this text as the basis for a protagonist to draw from in a humorous novel is not so much a trope as a possible detail of a past that very well could have been. In a novel that takes a lighthearted knock at the foibles of the earnest, most privileged class, one conceit smacks a bit odd: Fallis points out race when it isn’t white, signalling that white is the default audience, the assumed character base. While the book does a sound job showing how the most sincere, educated male feminist can still have blind spots, there may still be another blind spot in the text itself. A beautiful function of fiction is to not just show the world as it is, which this book does indeed – all references to contemporary media are spot-on, and characters engage with the world in a very natural way – but how it can be. Everett’s transition from troubled sideline feminist to an active, productive voice in the conversation shows an evolution that is entirely within the realm of the possible. He remains humble, maintains his sense of humour and gets over himself in an entirely useful way. Everett and his father, Billy, heal together, and the reading stays sharp and light enough while giving the real issues fair play. Imagine a crew of unassuming readers with invisible sexist tropes lodged somewhere within the recesses of their minds, chuckling along and finding themselves somehow subtly transformed while consuming this pleasurable novel – that scenario would be a literary conclusion to outlive the book itself. Lauren Bride is a Toronto writer. With a slightly different headline, you can click here to read the review online.